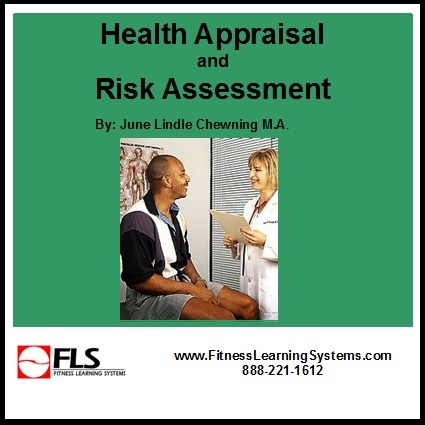 Health Appraisal and Risk Assessment are two of the most important responsibilities for a personal trainer. In this process, you identify any health issues your client may have and determine the level of risk for disease and/or injury. This information is used to determine whether physician’s consent is necessary before your client performs any physical assessments, or participates in an exercise or physical activity program. The Health Appraisal and Risk Assessment sets the stage for liability and your legal responsibility with your client. If this process is not performed properly, as dictated and outlined by the fitness industry, risk of harm to your client increases as does your risk of exposure to liability. It is an absolutely necessary and important FIRST STEP for all fitness professionals who work with clients in a one-on-one setting. Understand the importance and necessity of health appraisal and risk assessment for all clients. Learn how to properly perform a health appraisal. Understand ACSM risk factor thresholds for coronary artery disease. Be familiar with the signs and symptoms suggestive of cardiovascular and pulmonary disease. Be able to place your client into an ACSM risk stratification to determine whether a physician’s consent is necessary. You will practice the health appraisal and risk assessment process with sample clients.